My first experiences with green beans were quite possibly the exact same as yours. 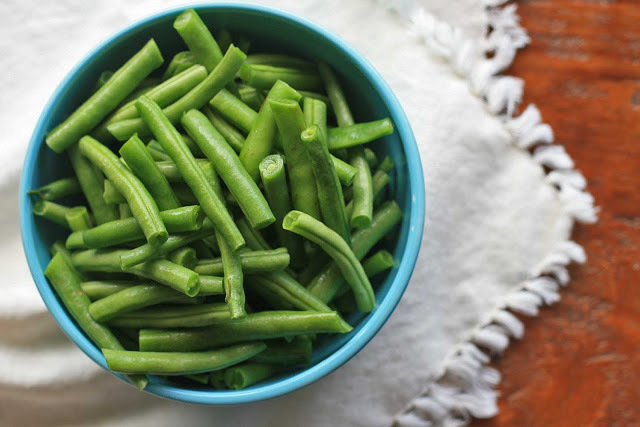 The divided cafeteria trays at elementary school often had a scoop or two of canned green beans with a greyish tint at lunch at least once a week. I suppose the lunch ladies hoped that there wasn’t enough chicken nuggets or pizza to sustain through the afternoon and that we’d be forced to eat the tasteless, mushy side. I may have tried a bite once, but after that the portion always went back 100% untouched. The only way I’ll eat the canned version these days if it’s it’s mixed in with a three or four bean salad. Otherwise, fresh is the only way to go. And although excessive amounts of cheese sauce is what lured me into eating broccoli and other vegetables when I was a kid, I’m guessing bacon could have also done the trick. 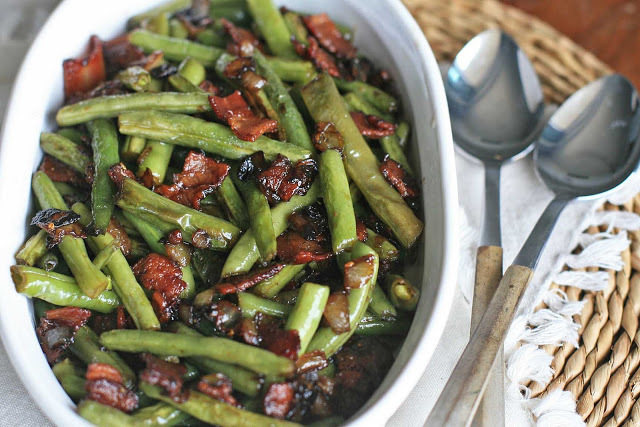 In this Southern dish green beans get cooked with bacon and onion and flavored with vinegar and sugar. 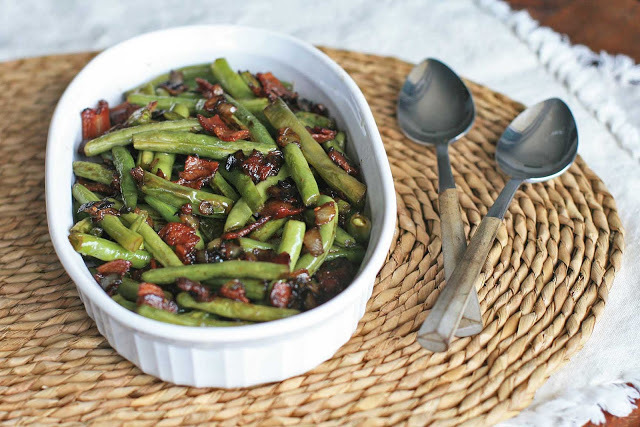 The rendered bacon fat helps cover each and every green bean with a tangy, sweet, and smoky glaze. This is another gem from Christy Jordan’s book, Southern Plate. Christy’s recipes are simple and delicious and the book is peppered with lovely stories of the South. Want to get a preview of her unfussy and unpretentious Southern Food? Check out her blog, also called Southern Plate. I think you’ll become a fan too. Heat a large skillet over medium heat. Add bacon and fry until crispy. Remove the bacon to a paper-towel lined plate and spoon out several Tablespoons of bacon grease and reserve for another use. Add the onion to the bacon grease and cook until softened. Add the green beans and cook until tender-crispy, or your desired tenderness. Add the sugar and vinegar and stir well. Add the bacon back to the pan and cook, stirring, for another minute or two. Season to taste with salt and pepper.